Those who read this blog may recall that I returned to the town of my birth during the month of June to enjoy the area during the warmer weather. (I visited a year before in the winter months.) While trip planning, I decided to set my sights on learning a little more about the many interesting and stately structures that dot the town. I learned that by the early 1800s, Bellefonte had become the most influential town in Pennsylvania between Pittsburgh and Harrisburg due to the booming iron industry. Today, many of those magnificent structures built by the titans of the time still stand. For those who need a frame of reference, Bellefonte is located just 12 miles northeast of the State College, Pennsylvania where my father received his bachelor's degree. He was a mere sophomore when I arrived kicking and screaming at the hospital in nearby Bellefonte and I think I recall being informed that professor awarded him an "A" on an exam that day. Of course, that could just be family lore; I'm not entirely sure. Those interested in visiting the Bellefonte area can easily fit in a little side trip to the thriving town of State College or stroll the grounds of "Old Main" in University Park and browse the blocks of shops that are located directly across the street from the college. 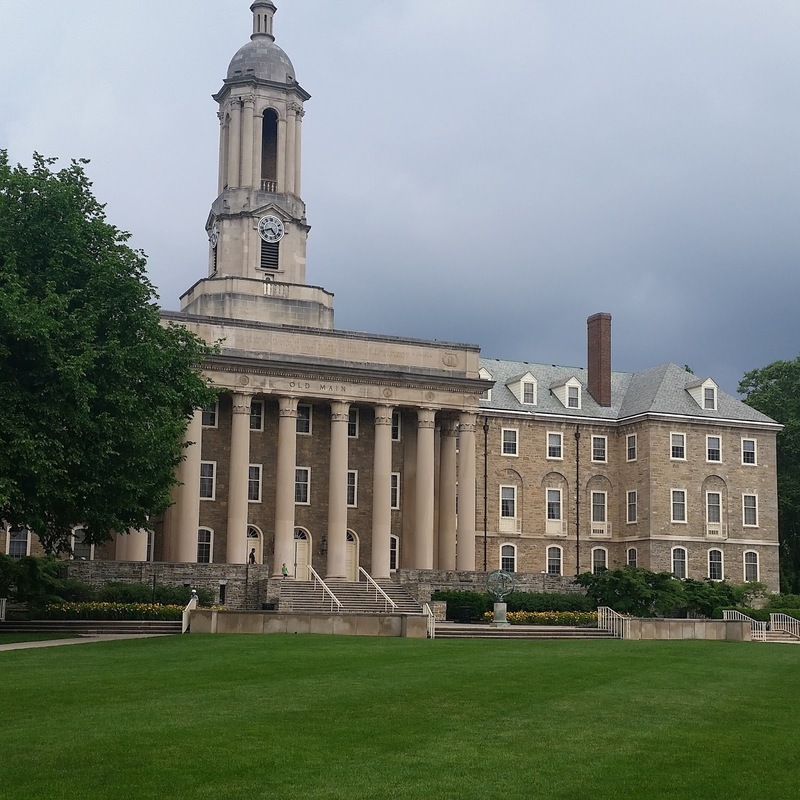 I took a picture of the campus prior to getting caught in a downpour the weekend of our visit. I'm not sure how many people imagine living like a local when visiting another town, but I often entertain such flights of fancy. When I saw all the grand homes, my reporter instinct kicked in and I wanted to learn more. Lucky for me, the Talleyrand Citizens Committee did the initial work by creating a map listing 46 structures with a brief explanation of each. Copies are available at the Central Pennsylvania Convention and Visitors Bureau located at 800 East Park Avenue, so I stopped on the way into town to grab a copy and let my imagination wander. It just so happened to be hot as blazes that weekend, so my goal of seeing each building fizzled along with my energy thanks to the scorching sun, but I am happy to say I managed to capture pictures of many of them, so without further adieu, here is what I learned on my self-guided, (albeit truncated), walking tour of Bellefonte. The First National Bank Building was once home to Pennsylvania Supreme Court Justice Thomas Burnside. First erected in 1872, it was later rebuilt 27 years later (this time with the Crider Exchange Building attached) after a fire decimated the home. The Talleyrand Park Citizens Committee describes the two buildings as "flamboyant examples of picturesque, eclectic 'anything goes' architecture." 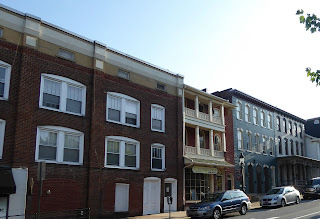 Located on East High Street on the North side of the courthouse, "Attorney's Row" contains examples of Italianate Period, Pennsylvania farmhouse and Georgian architectural styles. At 113 E. Linn Street sits the birthplace of American sculptor George Grey Barnard. Barnard trained at the Ecole Nationale Superieure des Beaux-Arts in Paris from 1883-1887 and is famous for the statues that flank the entrance Pennsylvania State Capitol in Harrisburg. Models of those sculptures can be seen at the Centre County Library and Historical Museum. You can see the statues and read more about a controversy that took place in 2011 in Harrisburg here. Barnard is interred in Harrisburg, as per his request to be near his art. Model of the sculptures that greet guests at the entrance to the Pennsylvania State Capitol can be seen at the Centre County Library and Historical Museum. The Brockherhoff Hotel, located at 105 S. Allegheny Street, was built in 1864 by Henry Brockerhoff, who also built a grist mill in the area. The structure is a fine example of 1860-1870 Gothic Revival architecture and operates today as an assisted living facility. The Reynolds Mansion was once the site of a tavern that was popular in the late 1700s and run by a man by the name of George McKee. The current imposing structure was built in 1885 by a wealthy businessman, landowner, and banker by the name of Major William Frederick Reynolds. The exterior stone, known as "blue brownstone" due to its hue, was quarried by the Hummelstown Brownstone Company in Hummelstown, Pennsylvania. The mansion incorporates Gothic, Italianate and Queen Anne styles and today operates as a luxury bed and breakfast. Daniel H. Hastings became Pennsylvania's 21st Governor and once resided in this impressive structure described by the Talleyrand Historical Society as a "polyglot" of architectural ideas, mostly classical. What I found most interesting about Hastings was that he began his career as a school teacher in Clinton County at the young age of 14 and by 18 was named principal of Bellefonte High School. Before being elected governor, he was involved in several other businesses, from coal mining to banking. Intelligent and industrious, he also worked as editor of the Bellefonte Republican newspaper. As a member of the Freemasons, Hastings also served as Worshipful Master at Bellefonte Lodge #268. This Georgian home located on the corner of Allegheny and Howard Streets was built in 1815 by John Miles, the son of Colonel Samul Miles, Mayor of Philly and founder of Milesburg. The house pictured above is located at 420 N. Allegheny Street and representative of the homes built by Ironmasters in the 19th century. This particular home was built by George Valentine of the Valentine Iron Company and dates back to 1879. By 1898, the Valentine Iron Company's heyday had run its course and the company was sold to out-of-state buyers at a Sheriff's sale. The Bush Arcade was built in the late 1880s to replace the original which was destroyed by fire. In the late 1880s, it was home to a bank, offices, a gentleman's clothing store, a post office, a dry goods store and other retail. Bellefonte's first hospital was housed at 113 South Spring Street. 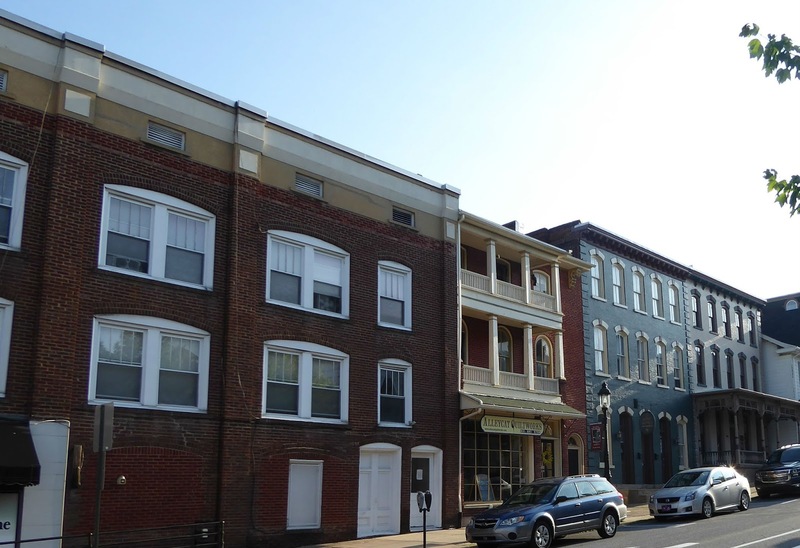 The lot on which the building stands was first owned by Thomas Burnside who practiced law in Bellefonte and went on to become a member of the U.S. House of Representatives and justice of the Supreme Court of Pennsylvania. Pictured above is what was once the abode of James Sanks Brisbin, a teacher who purchased and edited the Centre Democrat newspaper in Bellefonte and later served as a general in the Union Army during the Civil War. Built in 1865, it was constructed of bricks that were hand wrapped and shipped from Philadelphia and is a fine example of Italian revival architecture. Today the structure is home to offices. Anna Wagner Keichline was born in Bellefonte in 1889 and by age 14 she was breaking barriers by exhibiting her talent in woodworking and taking home first prize at the county fair for an oak card table and a walnut chest. Keichline studied at Pennsylvania State University before transferring to Cornell, where she was the fifth female to graduate with a degree in architecture. The enterprising and hard working Centre County native went on to become the first female architect in Pennsylvania. During her lifetime she worked on many projects, accrued seven patents, advocated for women's rights and served as a special agent during WWI. To this day, all of Keichline's buildings in the area are in good condition and in use. That includes the Plaza Centre, which now operates as an antique gallery, and is located at 124 West High. This was the site of a home belonging to Reverand James Linn, pastor of the Bellefonte Presbyterian Church. Linn's son Samuel went on to become a Pennsylvania judge for whom Linn Street is named. "The Manse" at 201 W. High once operated as the First National Bank and is a mixture of Gothic, Romanesque and Egyptian architecture. The picturesque building is now home to the law offices of Hamilton and Kimmel. Once part of the Pennsylvania Match Factory, Big Springs Spirits operates now as a distillery. Matches were hot back in the day and Bellefonte was home to one of the largest match factories in the United States, producing the product on this site from 1900 through 1947. Workers completed all aspects of production here, transforming a simple block of wood into all manner of matches, from strike-anywhere matches, to safety matches, parlor matches and noiseless double-dip matches. According to the historical society, the factory reached its peak employment during World War II, supplying water-proof matches to American servicemen at home and abroad. The match factory may have closed, but employees there are still helping people get a little lit. Big Springs Spirits has been operating in the area since 2014 and provides guests with an inviting space to kick back and socialize. Owners Kevin Lloyd and Paula Cipar now distill 12 libations, including vodka, several rums, gins, whiskey and cream bourbon, so when you tire of touring, Big Springs Spirits is the perfect way to end the day. These are just a few of the 46 structures on the historical, self-guided walking tour provided by the Talleyrand Park Citizens Committee. The map not only lists addresses, but also provides specifics on each of the structures, along with historical markers, information about the seven Governors who hailed from the area, topographical insight and other interesting information that makes the beautiful borough of Bellefonte unique. I will add an additional Bellefonte picture at the top so it shows up first, thanks. You can practically understand the world only from a tour. You will get to know what is happening in the world. It will give you best experiences to remember lifetime. In addition you will have a chance https://www.imanali.in/manali-tour-package-surat to know the different types of cultures, languages, religions and much more from various places.